Last week we wanted your opinion regarding a new endeavor we’re considering: a MakeUseOf magazine. We really appreciate all your insights, comments and ideas, and of course, the time you took to vote in the poll and make your opinion known. Out of 620 voters in total, these were the poll’s results: 1 person (!) would be willing to pay more than $10/month for a magazine subscription; 2% of the voters would be willing to pay up to $10/month; 10.5% think a magazine is a nice idea, but would not subscribe to one; 16% don’t like the idea at all; 20.5% would be willing to pay up to $5/month; and 51% of the voters would subscribe to a magazine, but only if it’s free. The poll had some terrific comments, and choosing the best one was harder than ever. We’d like to thank you all again for taking the time and expressing your opinions, but this week’s winner of a free MakeUseOf t-shirt is…. Alex D! Alex took the time to write more than one comment when he thought the first one did not get through, and had some nice ideas and insights about a MakeUseOf magazine. Congratulations! 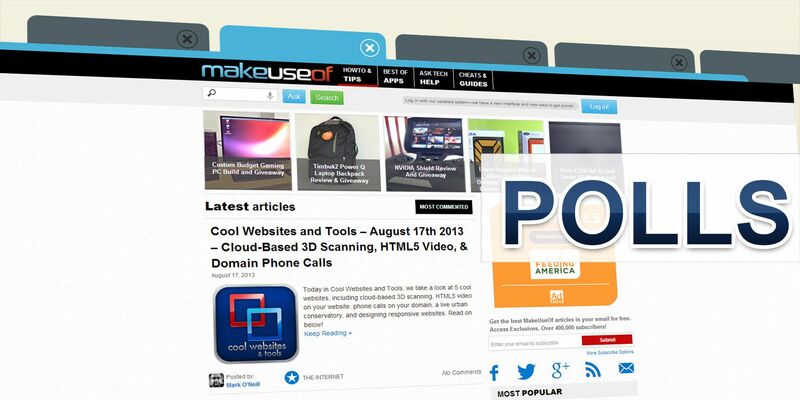 This week’s poll question is: How May Browser Tabs Do You Have Open Right NOW? This week we’re focusing on your browser. No, we’re not interested in which browser you’re using, how many add-ons you have, or how many browsers are installed on your computer. We’ve been there. This week, I want you to stop right where you are, and look at your browser window (or windows). How many tabs are open right NOW? 2? 5? 10? 20? If you’re reading this poll from your phone or tablet, count your open tabs on your mobile browser. If the only open tab you have open is this poll, your answer would be “one”. Start counting from there. Let’s see what your habits look like! How May Browser Tabs Do You Have Open Right NOW? Want to share which tabs are open? How many windows you had right at that minute? Or maybe you had multiple browsers open which skewed things a bit? Tell us everything in the comments below. Technically you are are allowed 255 open pages. This has been my understanding anyway. In reality, the actual will be far different. I have hundreds of tabs open. Legitimately hundreds of tabs. I've lost count. There is no number to tell me how many I have open that's why I open this up was to find out how many I have open. My tablet says I must close one before I can open another and I don't know how many or where this number is. "Open link in new tab"
Currently around 150-160 Firefox tabs. Can you imagine a world still on IE 6 with no tabs? I have way too many tabs open all the time. Also, I'm happy my comments on the last poll won :). I have 16 open right now. I have two windows open with 25 tabs in one and a whopping 91 in the other. 21 in Firefox, 16 in Chrome. I only use IE for sites that needs. Mostly tabs keep growing until laptop sometime shutdown with low battery. Normally, never get to remember to pin them. Never used Facebook or Twitter, only LinkedIn. if l had read your email 5mins earlier than when l did the count would have been more like 55+ tabs... cheers! Years ago I used only Internet Explorer. I was introduced to Firefox while travelling when I had to use it in an Internet cafe that did not have IE on its PCs. When I got home, I downloaded FF with its lovely multiple tabs (that IE did not have at that time) and since that time have used IE only when necessary. I never have IE only open, but I sometimes have it open as well as FF. At the moment, with Firefox only open (and set up to reopen as at closing) -- 25 windows with a total of 1689 tabs (1179 with URLs, 510 as "New Tab" dividers). The window with the most tabs has 229 (150 active and 79 dividers). The window with the least is the newest one (started yesterday) which has 19 (13 active and 6 dividers). (b) 12 to online TV guide B (which doesn't go back further than yesterday) -- 4 for yesterday (early hours, morning, afternoon/evening, and night/primetime) and the same 4 for today and tomorrow. Another window related to TV has multiple tabs to epguides.com and other sites for multiple programs. When I read an article, I often click on links in it and open multiple new tabs to check the content. When I have finished the article, I sometimes close that tab but also sometimes go to the article's home page and look around the site. Ditto those tabs I opened from links in the article -- sometimes a quick glance is enough; sometimes a look around is warranted. In each case, if there are readers' comments, I might leave the tab open to check for new comments later, sometimes not closing it for several days. I also keep a document open with a list of the links in each window but do not constantly update it. That list is of assistance if/when all of the windows do not reopen on a restart after Firefox has crashed or because of some unknown reason. To try to guard against losing my (precious?) hundreds of tabs, I also keep copies of the Firefox sessionstore.js and sessionstore.bak files in a temporary folder. They have saved me from "panic mode" on a few occasions when Firefox opened as new (i.e., one window, one tab). I exited Firefox and replaced its new, clean sessionstore.js and sessionstore.bak files with the ones from my temporary folder. When I reopened Firefox, all of my windows and all of my tabs were back. Wow... I'm speechless. :) Thanks for sharing this! Currently have 1750 tabs "open" in Firefox 21. Have had up to 2948 tabs open, but then Firefox responds very slowly. This is with 8GB RAM, standard hard drive, and Windows 7 x64. Note: there's a difference between "opened" tabs (where most tabs are NOT currently "loaded")... and "loaded" tabs that are fully-functional and "alive". If I "load" more than about about 120 tabs, Firefox will crash -- unless I preemptively close it first... Upon restarting, Firefox will then "open" all of the previously opened and loaded tabs, however with only one tab "loaded", which is the last "focused" tab, and the process repeats while the total number of tabs grows. This is using the "Tab Mix Plus" and "Session Manager" add-ons, with 'Restore tabs on demand' selected in the latter. One more thing, the "Tabhunter" add-on for Firefox is essential to actually use (search for, and quickly access) all of those open tabs... Many other add-ons help also, but they're too numerous to mention. Also, I currently have 47 tabs open in Chrome 28 -- and 16 tabs open in IE 10. But Firefox is the only one that can handle hundreds, or thousands of tabs. How did you count them? As I don't know of any other method, I had to count mine one by one. In Firefox (using 20.0.1) click on the Firefox logo in title bar (ABOVE File in the menu bar -- don't click on File by mistake) and choose Close from the drop-down menu. A pop-up window appears titled "Confirm close" which says "You are about to close ___ tabs. Are you sure you want to continue?" The ___ is the number of tabs in that Firefox window. Does Internet Explorer have something comparable? If the browser is open, that's one tab. When it jumps to a new page (such as the poll) I have it set to open a new tab. So at the moment, two. If this poll were on a sublink, I'd have three. I have no inhibitions about having tabs open, and regularly use the convenience of the tab system for cut and paste and such. Just that right now, the answer is two. Right now, 5 in Chrome. I usually have 8 to 10 tabs open. One open on Facebook and the second one opened to respond to your poll. I have 9 tabs open right now , I like grasping more and more information .. I currently have 4 normal tabs open (1 Youtube and 3 Makeuseof) and 3 pinned tabs (Coursera, Feedly and my website's cpanel login page). Though this is much less than normal because when usually on Makeuseof, I will open all the article for the day at once in each tab. About 160 (not including the ones open on the iPad). There should have been an option that said "Too many". The downside is that Firefox often uses a quater (and sometimes up to half) the total memory of the system. But the system as a whole doesn't slow down that much. Not bad for a laptop bought in 2007 running Vista with 2GB RAM! Computers are getting more powerful these days. It won't hurt much if you opened more than 15 tabs. I keep my tab count as low as possible. As simple as that! i have work related site, news and makeuseof at the same time. i enter a site and then browse another and when i finish the current site then move on to others. i also like to open every link in a different tab which gives me freedom from moving back and forward with sites. this is much better. 45 tabs (4 pinned tabs + 41 regular tabs) in one Firefox window. I've 47 open currently, in vertical tab bar (treestyle tabs). 43 across 3 windows . . . with links to another 796 on my OneTab page. One tab in phone ..! Actually I ve read this article in Pocket ..
but came to here to notify MUO that there is one typo in the heading ..! :) for fixing ! but I ve found that very easy ! may be tough for other eyes ! Right now on my personal laptop it's 16. At the end of a work day on my work laptop it would be greater than 20. I close the extras when the box is running slow. Reading the previous replies, I feel inadequate. Most of the time I have 2-3 tabs open, I rarely go over 5 tabs. 66 in Firefox, eight in Chrome. Another 51 in an RDP session on another machine I'm using simultaneously. Were I to look globally across all the machines where I'm logged in and doing something, plus all the tablets and mobile devices, it's probably somewhere around 400 - 450. Some of the tabs have been open continuously for as much as four years, too. Wow! Can you give an example of a tab that's been open for 4 years? That's probably a world record. I have lots of tabs that have been around that long. I usually have a window of persistent content that I look at every day or two that includes things like my calendar, many of the web comics and blogs I keep up with and some pages that I update myself. I've been using the Firefox Session Manager extension for years to maintain all my tabs and windows and ensure that my browser environment stays with me even in spite of my fairly regular computer upgrades. 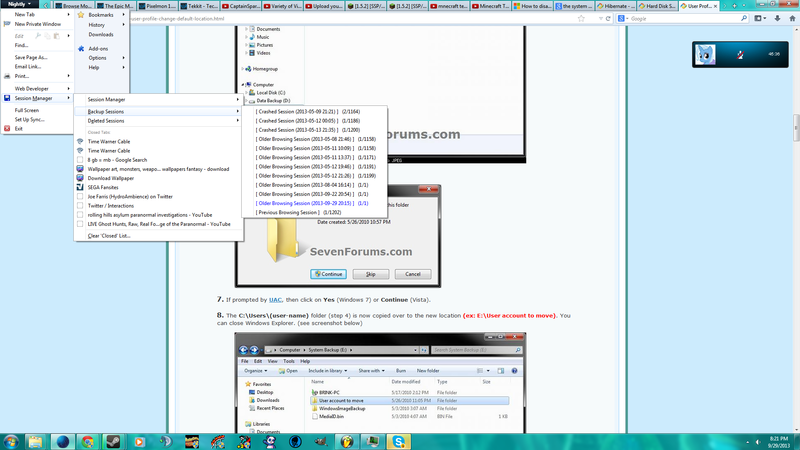 In Firefox...7 tabs pinned...278 total...damn news feeds. Bad habit of keeping things open rather than bookmarking. The Showcase extension helps to manage. when it gets to 120 - once every few days - i save the session, and start afresh. THIS! I thought I was the only one with a "problem". I have G+, gmail, blogger, Outlook, Facebook and twitter open at all times as these are my most used sites. I usually have at least one other tab open be it MUO, BBC news/sport/weather, I09/Lifehacker/gizmodo, Amazon or my online banking. I know I shouldn't have so many open, but It can be annoying opening and closing tabs over and over again especially when I want to share from one site to another. One day I will learn . . . but not just yet! I currently have 824 tabs open in Firefox. Screenshots available upon request. do you own a mainframe ??? Seriously? 824 tabs? On how many windows? More importantly, why?? so you have some 256 GB RAM and dual processors (4th Gen Intel Core i7) ?? yo man , How can you manage all that tabs ..? you need a program for finding the tab ! lol !! I don't have any tabs open right now, actually. I'm using an RSS feed reader. 20+ on Firefox and IE 11. Chrome is a POS. School Mail, facebook, Weightwatchers, ActiveLink, an article about a running app, feedly, makeuseof, a vegetable butterfly app. This is very typical for me, many times there are even more open. Sometimes I will close them down to about 3 or so, but within a couple of minutes, have a bunch open again! My browser also opens up to about 6 pinned pages. 3 pinned and kept opened - plus 1-3 more depending. Easily over 20, 10 of which are usually pinned tabs. In other words, always available to me every time I open the browser. I have this page, another one that I want to look at later, then four app tabs: Facebook, Google Calendar, my personal email, and my school email. Right now i have 2 tabs open an, 1 in each window but most of the times i have over 5 and prefer to use 2 windows split in 19" 1440*900 display.